AS Roma Vice-President, Mauro Baldissoni, has welcomed last week’s news that the club’s Stadio della Roma stadium project has received the backing of an independent technical report – declaring that the time has come for the Serie A club to be allowed to begin construction on the project. On Tuesday morning, the Mayor of Rome, Virginia Raggi, confirmed that the independent Politecnico di Torino, who had been asked to investigate the various transport issues involved with the proposed new stadium, had issued a positive assessment of the club’s plans. It is about time the city has the opportunity to see the results of all these discussions and all this investment and that Roma can finally begin construction of the stadium. The Vice-President spoke to asroma.com to explain what Tuesday’s news means – and where the Stadio della Roma project now stands in the final approval process. What were the key points from the report? What does it all mean for AS Roma? “It underlines the fact that the stadium has been planned with the most up-to-date and modern infrastructure choices available to us. We have invested a lot of time, effort and money in it – perhaps to an extent that has never been seen before, for a construction project of this type. What are the next steps now? “All that remains now is to go through the few outstanding technical and administrative steps to complete the final approval. First of those will be the approval of the ‘urban variation’. We are continuing to work closely with the administration on that. Everything has been discussed, there are no contentious points still to be resolved. All that remains is to address a couple of technical issues, which will then allow a date to be set for the final vote on the variation. “Then, once that is done, the project can be passed on to Lazio Regione, who will issue the final building permits. We expect that will conclude everything as far as the approval process goes, and hopefully as soon as possible. A new state-of-the-art, world-class, 52,500 seat venue, Stadio della Roma is being custom-designed by Dan Meis of MEIS Architects to create an outstanding game day experience for fans. The new stadium’s sightlines and proximity to the pitch are designed to deliver the most vivid and action-packed fan experience in all of world football. Every seat will offer unparalleled views of the action. Stadio della Roma will proudly represent the city of Rome – a glorious mix of past, present and future in design and materials. The architecture will pay tribute to Rome’s rich history, while embracing the internationally-acclaimed modern and innovative Italian design aesthetic. It will serve as an anchor for a larger new privately owned and managed mixed-use development. This entertainment district will become an active seven-day a week hub for dining, entertainment, work – including a new conference centre – hospitality and sport. It will transform the way Romans weave sports and entertainment into their daily lives. Stadio della Roma is located southwest of the city, on the site of Rome’s former standard bred Hippodrome in the Tor di Valle district. The Tor di Valle project – which includes a business park – has been designated by the Comune di Roma as a project of public interest for the city of Rome and its citizens, projected to contribute considerable private investment and many permanent jobs. The new stadium will be well positioned to be a destination for Fiumicino travellers and employees, which is set to undergo a massive expansion in the near future. 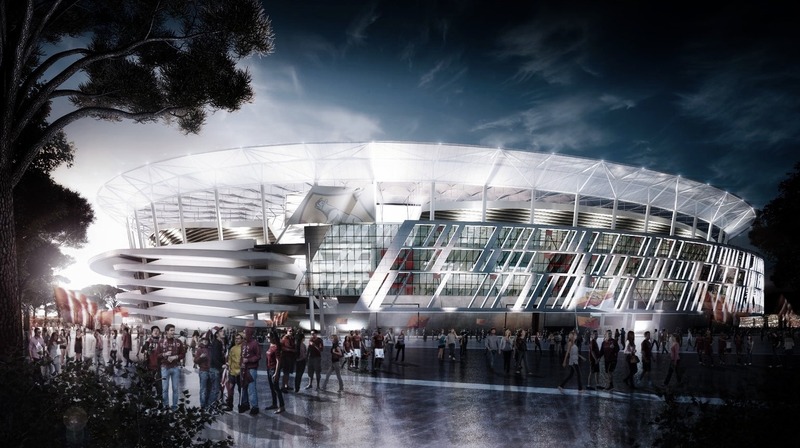 Stadio della Roma will be amongst the world’s most state-of-the-art football stadiums. With a focus on both intimacy and ‘home pitch advantage’, the design integrates one of international football’s most tightly organised seating bowls with world-class amenities and technology to rival the best new stadiums in all of professional sports. Intended to evoke one of Rome’s most beloved and iconic landmarks, the Colosseum, the design incorporates an ultra-modern, steel and glass stadium, wrapped in a stone ‘scrim’. This scrim, a floating stone screen that envelops the stadium is a dynamic contemporary interpretation of the stone arches of the famous arena. A translucent glass and Teflon coated fabric canopy protects the entire seating bowl from the elements. This modern colosseum will anchor a 365-day-a-year destination of shops, restaurants and bars, including a Roma Superstore and an interactive AS Roma Hall of Fame. Situated just north of the stadium will be a state-of-the-art training and wellness facility dedicated to AS Roma’s first team training. In addition to two full-size and one half-size training pitches, the centre will employ the latest and most sophisticated training technology and equipment. Roma Village will offer a compelling range of entertainment and dining venues, situated around a new, modern interpretation of Rome’s famous Spanish Steps. Visitors will have the ability to experience the history and heritage of the club in a modern social setting, seven days a week. The Roma Village experience starts with a gateway past the new Roma Superstore. Inside, fans can enjoy the AS Roma Hall of Fame & Museum, which will celebrate the history and heritage of one of the world’s most storied clubs.